Of all celestial bodies, the moon has the most mysterious power, pushing and dragging the sea to and from shore. There is a beauty in the ebb and flow, a pattern in it all. Certain music has the same effect, an inexplicable, enigmatic ability to change us. As we’ve come to learn over the past seven albums, no one does this quite like Beach House. Even more remarkably, the Baltimore dream pop duo’s career, up until this point, mirrors the lunar cycle. Here’s a look at the phases of the moon within the context of the discography of Beach House. The first phase of the moon cycle is the waxing crescent—the first step on this cyclical journey. In 2006, a Baltimore-based duo by the name of Beach House released their first album, a self-titled album that introduced a collection of moody tracks to be listened to with the bedroom curtains drawn. Their potential had already started incubating this early, although they were merely a prototype of what they would develop into. The waxing crescent represents intention, and from the first lick of “Saltwater,” a haunted carousel dirge of sorts, their intention was apparent: This was a pair of musicians with a commitment to a sound reminiscent of Cocteau Twins and Slowdive while still sounding entirely unique. Right out of the gate, Beach House had created a captivating calling card. The first quarter moon is about decision-making and taking action. Beach House had a lot of decisions to make after their debut made a splash on the indie scene. How rapidly should their sound evolve? Could BEACH HOUSE simply be a lark, an exercise in low-fidelity shoegaze and nothing more? The glorious “Gila,” showcasing Legrand’s languid vocals and Scally’s rumbling guitar playing, demonstrated that Beach House wasn’t going anywhere soon. DEVOTION saw the duo making key decisions about who they were and who they wanted to become. While sharing much in common with its predecessor, DEVOTION hinted at a drift away from lo-fi and towards a cleaner sound. The theme associated with the waxing gibbous moon is refinement. On TEEN DREAM, Legrand and Scally honed in on their signature sounds with painstaking detail. The bubbling guitar hook of “Zebra” opens the album, making it instantly evident that the duo had stepped up their game. Fuller and overall more uptempo, TEEN DREAM ignited the realization that Beach House’s music could be classified as a form of pop. These songs were more structured and therefore catchier, and the lyrics were as relatable as ever. The sparkling “Silver Soul” and the gut-wrenchingly melancholic “Take Care,” for example, solidified Beach House’s power to transport us emotionally. These are songs had the ability to soundtrack our own lives by combining the exhilarating highs of young love with the aching comedown when it all falls apart. BLOOM is the climax of this figurative Beach House cycle: the full moon. The symbol of the full moon involves the sealing of intention and the opportunity to harvest one’s endeavors. On BLOOM, Beach House did just that. The songs glowed with energy, expanding and dissolving with dramatic mastery. Their sound evolved into ethereal dream pop with the ability to fill a stadium without compromising their dedication to artistry. While not a concept album, BLOOM is best enjoyed end-to-end. A fuller experience comes from allowing the tracks to flow into one another, interspersed with cassette clicks and the hiss of cicadas. It becomes a mood, an idea that cannot be described but can be felt. Though sonically miles away from their earliest works, there is still a connecting thread—the same commitment to instinct and emotional truth. Beach House would cultivate this phase for the next three years before transitioning into the second half of the moon cycle, a gradual shedding of the past and preparation for the future. By this time, TEEN DREAM and BLOOM had garnered enough acclaim and exposure that their next release was highly anticipated. Beach House was in a fortunate position—they had a devoted fan base whom they could trust to follow them on this journey. Because of this, they didn’t have to find a way to repeat BLOOM, but could instead expand in a new direction. DEPRESSION CHERRY doesn’t feel foreign, per se, but the crystalline guitars of BLOOM and the inverted reflection of DEVOTION have distilled into something new. The waning gibbous moon represents gratitude, and in a strange way, you can hear it in the music. This album sounds like it comes from a band who can make the music they want to make, without pressure from outside forces to change it. A group that could hold a series of intimate installation-shows while headlining music festivals. In this period, they truly exercised the best of both worlds. Beach House kept its audience on its toes when they dropped a second new album within two months of DEPRESSION CHERRY. THANK YOUR LUCKY STARS proved once more that Beach House has the power to do as they please. The third quarter in the lunar cycle represents forgiveness and letting go, reflecting on past accomplishments while preparing to shed them. Their sixth studio album felt like a reconciliation of past themes. It’s darker than DEPRESSION CHERRY, mirroring the slow disappearance of the moon as it completes its cycle. Another interpretation of the third quarter moon is taking something old and getting the best out of it—THANK YOUR LUCKY STARS wears its past inspirations like a fashionable old coat. It treads similar ground as past works, combining the unwashed, coarse sounds of early albums with the grandeur of more recent works. Beach House sound like they’re coming to terms with itself. 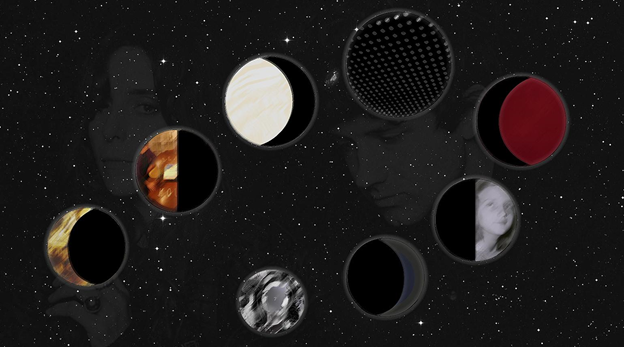 The last phase of the lunar cycle, the waning crescent, ends up syncing with Beach House’s B-SIDES AND RARITIES, a collection of curios with a scattered timeline. While listening, it feels like we get full disclosure—there’s “Wherever You Go,” the dreamy hidden closing track off BLOOM, a haunting and vaguely demonic remix of TEEN DREAM’s “10 Mile Stereo,” and a variety of other gems that up until this point had been buried away. B-SIDES AND RARITIES tosses us back into the sea of heavy reverb and ambiance, the incense-filled haze of days of Beach House-past. The waning crescent is a symbol of surrender, of letting go. And on this release, Beach House let us in. The curtain is dropped and we can sit in the beautiful mess scattered around us. It feels like a dusty old box of keepsakes you stumble upon in your attic, fondly handling each talisman before putting the lid back on. Like the waning crescent, it’s the last step towards completing the cycle. Questions have been answered and secrets have been revealed. Legrand and Scally cleared the way for the next cycle to commence. This brings us full circle. Beach House’s newest addition, 7, is the new moon. Encapsulating both the beginning and the end, the new moon is a symbol of new beginnings and anticipation of the journey that is yet to come. 7 is not a version of Beach House we have encountered yet. Even the album artwork, which is a distorted collage of media, leaves it shrouded in mystery. The mesmerizing intro to “Lemon Glow,” the heart-racing build of “Dark Spring,” and the spectral layered vocals of “Black Car” give us a glimpse into the future. The full moon, by its nature, is cyclical, and so it only seems natural that certain aspects of 7 bring us right back to the start of Beach House’s journey. The intro to “Dive” begins with an organ that instantly evokes the intro on their very first track, “Saltwater.” The haunted carousel dirge makes a comeback, although this time infinitely more polished. Still, it’s clear that the origins to this intro could be found all the way back on BEACH HOUSE, and so on the full moon we realize that although Beach House has transformed astronomically, a part of it will forever be the same. We begin the next cycle with 7, only this time we’re not in a beach house—we’re in a palace. From this exploration of Beach House’s winding career, one thing remains certain: whichever way Beach House shifts the tides, we’re in capable, cosmic hands. Claire can be found at a coffee shop/craft fair/woodland forest near you. Follow her as she attempts to craft playlists to soundtrack every moment of her life as if it were an indie film.